When you think of hair vitamins, what’s the first thing that comes to mind? I’ve always thought swallowing a big, chalky pill was the only way to get all the nutrients I need for my hair. 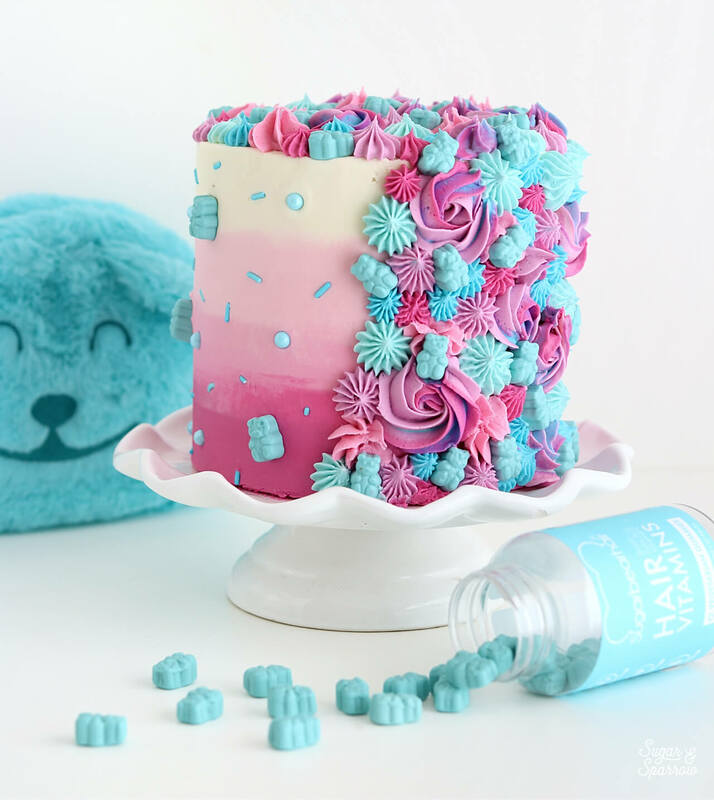 So when SugarBearHair reached out and asked me to create a cake design with their gummy vitamins and sent me a few bottles for inspiration, I was really excited to try them out (both for the health of my hair and for the sake of testing products firsthand before I promote them). It’s been a month and a half now and I can honestly say that the look and feel of my hair has improved – it’s softer, shinier, thicker than ever, and has grown about an inch (updated 2/18/19)! 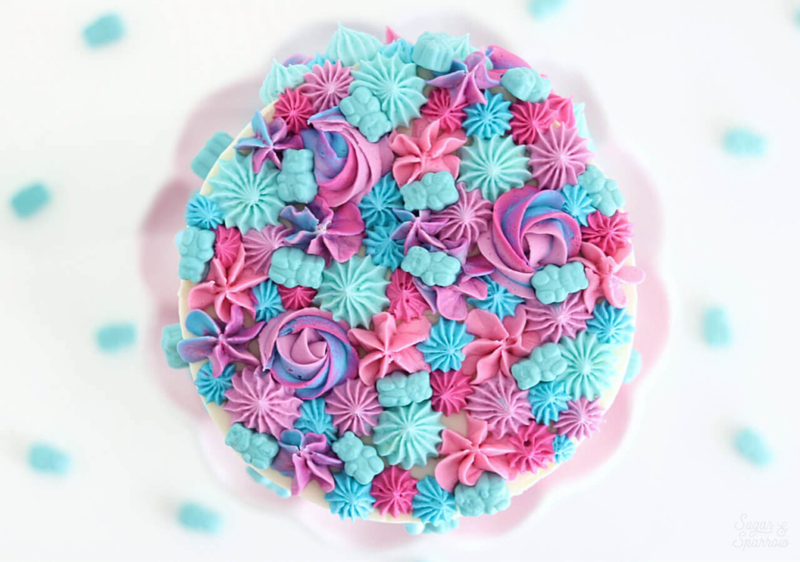 So to celebrate these tasty little gummies that have become part of my beauty regimen, a cake was in order. 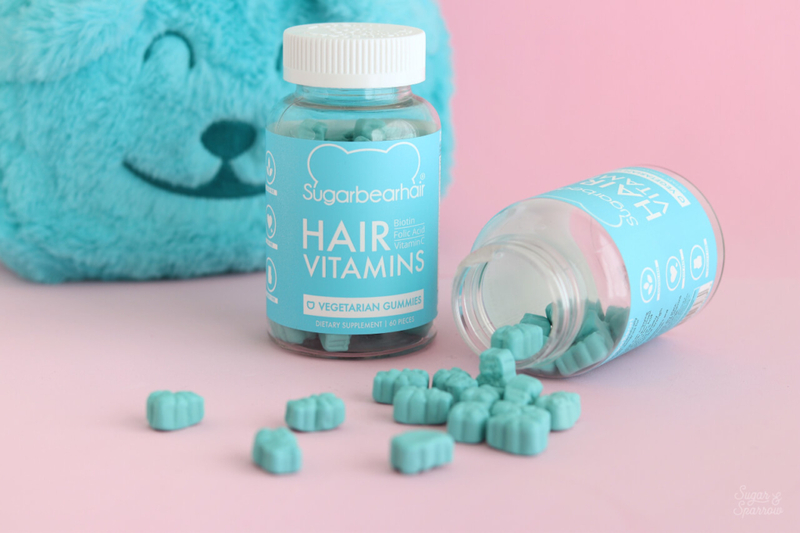 SugarBearHair is the world’s first gummy vegetarian hair multivitamin. In addition to being packed with tons of vitamins that are scientifically proven to benefit hair, they’re cruelty-free and also free of gluten, wheat, soy, dairy, and gelatin. They’re made with a synergistic blend of vitamins and minerals that work together to help your body produce biotin (aka Vitamin B), which helps with hair health and growth. Plus, one dose (two bears) contains as much Vitamin B12 as 4 organic eggs, as much Vitamin A as four cups of broccoli, and as much Vitamin C as 1 cup of cranberries! That’s a whole lot of vitamins, people. 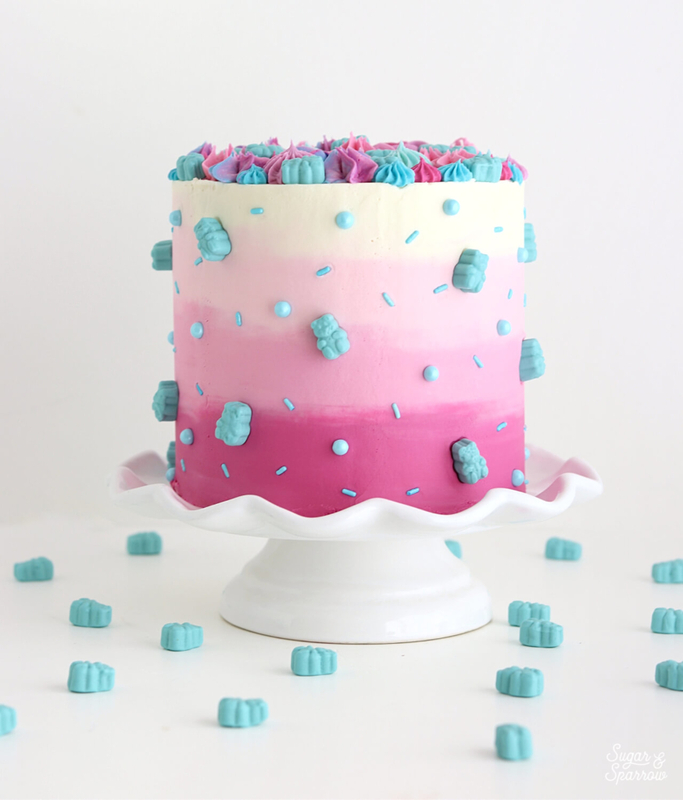 While enjoying these SugarBearHair Vitamins with a slice of cake is the perfect way to satisfy your sweet tooth and get your vitamins at the same time, you don’t have to combine them with anything to make them tasty. They actually taste delicious on their own (like blueberries! ), which makes me look forward to eating them everyday. My husband has started taking them as well, but I think he’s more interested in them because they taste like candy as opposed to the hair benefits. We’ll see how his hair looks after some time goes by though! 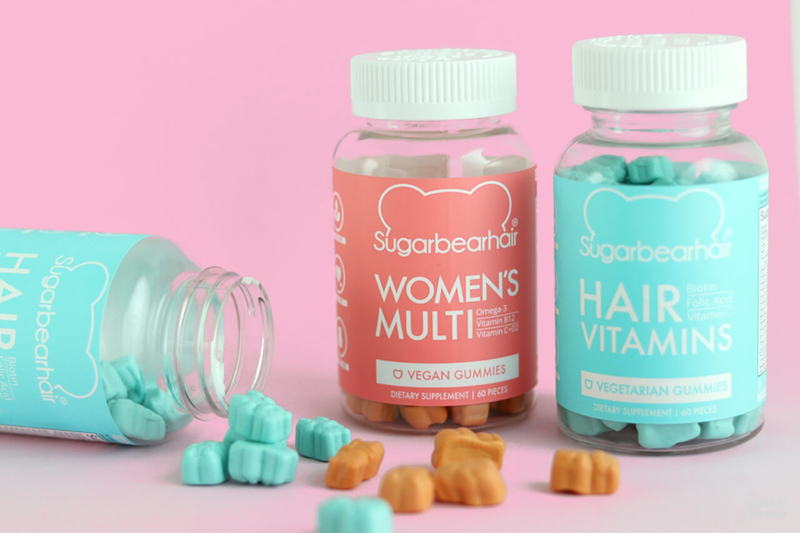 SugarBear also sent me a few bottles of their Women’s Multivitamins that are 100% Vegan and I was so surprised to hear that you can actually take them in addition to their hair vitamins! I decided to add them into my daily regimen about a month ago and am really happy with the results I’m seeing. In addition to my hair feeling great, my skin feels softer and more clear, plus my nails are growing faster than ever. In the past I’ve struggled with thin, brittle nails but I can honestly say they feel really strong and the length is amazing! Whether you’re looking for a hair vitamin that actually tastes good (and works!) or if you’re ready to change up your multivitamin supply, SugarBear makes some wonderful options. Head on over to their shop to get your hands on some! And if you do end up trying them, let me know. I’d love to hear about how you’re liking them! 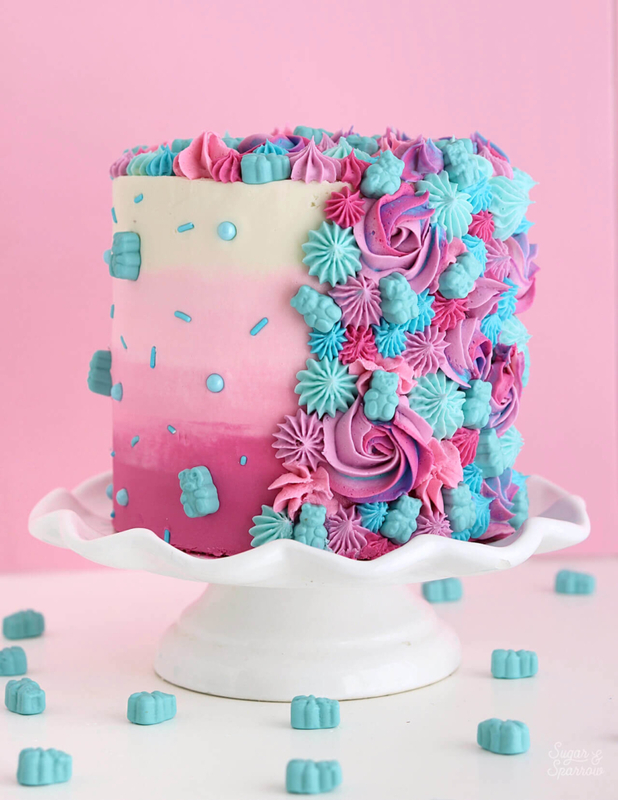 Disclaimer: I was compensated by SugarBearHair for my work of creating this cake, styling, filming, photographing, and writing about their products. As always, all opinions are honest and my own. Thank you for supporting brands that support Sugar & Sparrow.